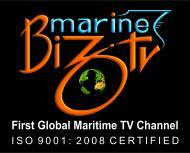 Marine BizTV is the World's first 24 hr free to air Global Maritime Satellite Channel dedicated to the maritime related industry. We have complete telecast over Asia, Australia, Africa and Europe. Marine BizTV does online distribution with parallel streaming through WebTV www.marinebiztv.com We have the largest global database related to all segments of the maritime sector and therefore a worldwide reach for any maritime related information, activity, event, program, advertising & product launches.